Each year we seem to hear more and more about injuries in the sport of football. Concerns about concussions, head and neck injuries, and rare fatalities has brought nationwide attention to the safety of the sport. Therefore, as a part of a Kansas state-wide effort, Abilene High School, along with the Kansas Athletic Trainers’ Society, are sponsoring a “Safety in Football Campaign” in order to share tips and directions on how your teams can improve safety, lessen the risks of injury, and keep the focus on the fun and camaraderie of football. At Abilene High School, Athletic Trainer Justin Clark, from Memorial Health System Rehabilitation and Sports Medicine, provides excellence in sports medicine health care for student-athletes at Abilene High School. Specializing in the prevention, examination, diagnosis, treatment and rehabilitation of emergent, acute or chronic injuries and medical conditions, Clark works each and every day to ensure for the safety and well-being of the Abilene High School student-athletes. As Cowboys hit the field this Friday versus Clay Center, Abilene High School and the Kansas Athletic Trainers’ Society are inviting you to follow the Cowboy football team throughout the game, and entire season, on The General KABI 1560AM radio and in the bleachers to learn how athletic trainers and schools in Kansas are making football safer for athletes each and every day. In addition, Abilene High School, along with numerous high schools in Kansas will be donning a small sticker on the back of each player’s helmet. The sticker represents the cumulative efforts of these schools and the Kansas Athletic Trainers; Society towards improving safety in youth football in the state of Kansas. Athletes who participate in football have increased self-esteem, lower dropout rates in school, and demonstrate a stronger involvement in their school and community. 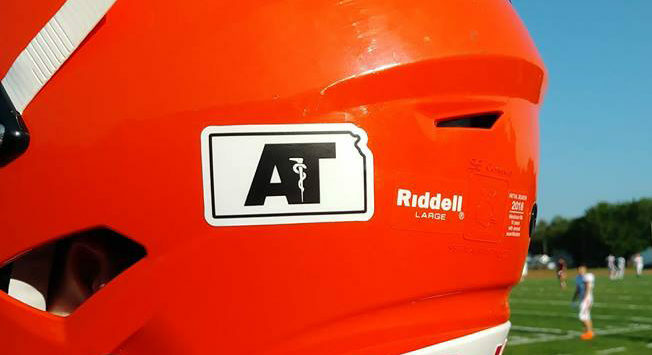 Abilene High School is excited to take the lead in this effort, along with the Kansas Athletic Trainers’ Society, to help each and every football team in Kansas identify ways in which they can lessen the risks of injury and, again, keep the focus on the fun and camaraderie of football.